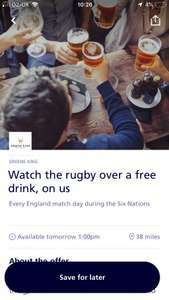 Free drink from o2 priority for every England match during 6 nations. Starts 10 February. 5000 drinks available from 1pm. February is now in full swing, as is the Six Nations. Get into the rugby spirit, head down to your nearest participating Greene King Local and get a free drink on us from 1pm - 8pm on Saturday 23/02/19 only. There are over 800 participating pubs included in this promotion. I meant including the offer, as I don't think it ran last time. I don't think @Arsenal012019 is concerned about rugby tbh! I have no idea about rugby, knew the Six Nations had started recently but no idea on the exact day. I meant including the offer, as I don't think it ran last time. I don't …I meant including the offer, as I don't think it ran last time. I don't think @Arsenal012019 is concerned about rugby tbh!I have no idea about rugby, knew the Six Nations had started recently but no idea on the exact day.